Last night I chaperoned the school Winter Formal dance for the first time. It was interesting. Styles have definitely changed since I was in school. Hemlines seem to be getting higher and higher, and then when the girls dance they seem to ride up ever higher! When I was in high school everyone wore long dresses. But it was fun to see my students having fun, and to see them excited to see me there. It was fun to get dressed up myself. I just wore the same dress I wore to Phantom, but I did my hair in an up-d0. ...and here I am as a sophomore. 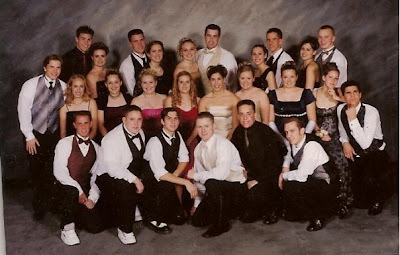 This was my first formal dance of high school...I loved the dances! In the group picture Chad is wearing my shoes. I still have those. It's always funny to look back at old photos. We would spend HOURS on your hair. That was fun. 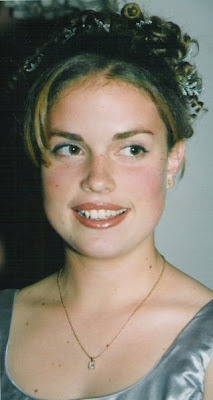 What a fun flash to the past... love the updo you had for the dance on Saturday! You looked gorgeous!